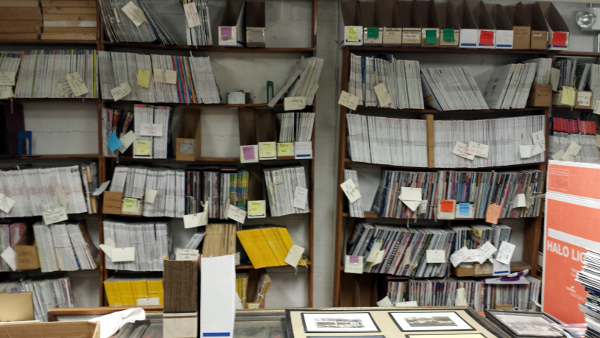 Three full time staff,one part time aide, one maintenance (part time), one part time that works with periodicals. Open 48 hours per week, open late on Thursdays from 10:00 a.m.-9 :00p.m. Established September 1912, 102 years service. Original building was a Carnegie Library in Ripley Park. Current location was the former post office built in 1917. 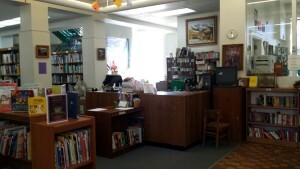 The library moved into this building in 1969 when the new post office was built on the other end of the block. 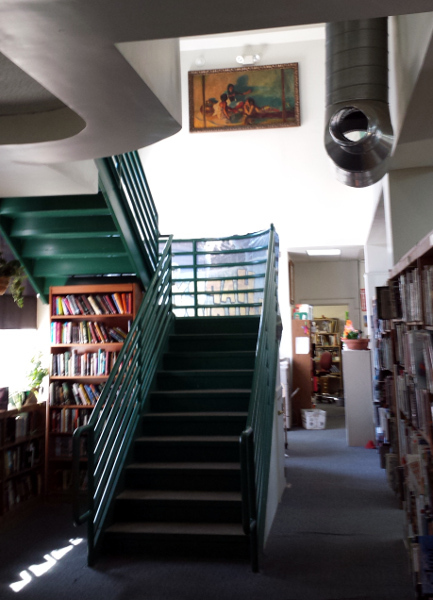 It was leased to the city for 30 years for $1.00 as long as it was used as a library. Ownership was given to the city in 2009. Older patrons remember when this was the post office and comment on the original tiles inside the front doors. Sunny YA section. This nook under the stairs looks like a teen magnet to me! purchase art for the library . She also acquired WPA art pieces. These pieces still hang in the library, and in fact, the art collection has pieces by Bert Geer Phillips, Charles Berninghaus, Sheldon Parson, Fremont Ellis, Gene Kloss, W. P. Henderson and others. Our current challenge is lack of staff . With a collection of over 50,000 books and materials (not counting back issues of periodicals) to keep current and maintain as well as over 30,000 visits per year, the old days when we had 4 or 5 full time staff members and two part time teens (who were always wonderful and a lot of fun) seem like they were a LONG time ago . Still, the staff works hard and we maintain the collection, the computer network, and as much one on one service and aid as we can. 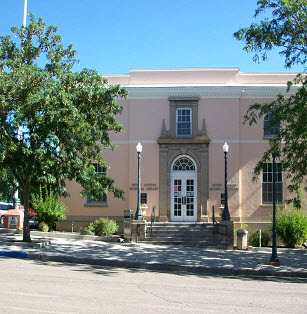 Speaking of the teens, Angie Manfredi, the children and youth librarian in Los Alamos, started her library career here at the age of sixteen. The Raton High School Librarian, Aimee Maldonado Feldman, started her career here as well. Other teens from this library have gone on to earn degrees in finance, anthropology, crime scene investigation, theater, and one is working on his PhD in history. 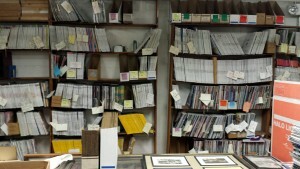 The basement houses a very impressive and extensive collection of back issues of magazines. THese are carefully organized and beautifully labeled — ala’ Martha Stewart! large buckets from the second floor, down the elevator shaft, and into the basement where they live today. 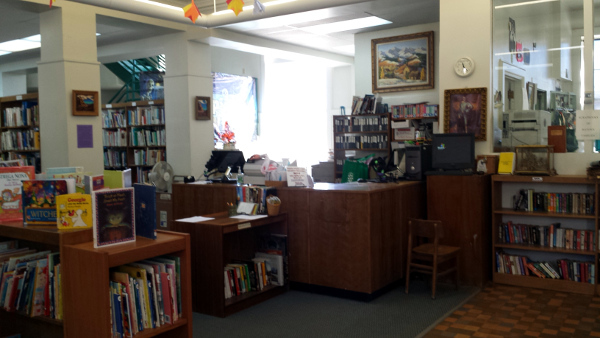 Every shelf, book, chair, counter and table was moved at least four times as various parts of the library were renovated. (The last time was to put down the carpeting .) The art collection was stored safely out of the way. (Just for your information, I had been here less than two years, and it was an EXPERIENCE,believe me. 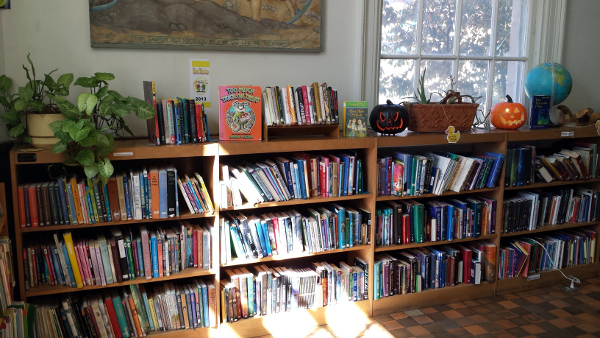 The State Library administered the LSTA grant, and once two ladies were up to make sure the money was actually going to what it was supposed to . The mezzanine above the open space on the first floor was cut out, but no rails. So Richard is standing there talking to them and a guy on a ladder on the second floor falls off the ladder, through the mezzanine, RIGHT BESIDE THEM. So they reported construction was happening.) So the library served the public through major reconstruction. I am re-reading Georgette Heyer and waiting on Lee Child, J .D. Robb, Robin McKinley (if she ever gets the sequel to “Pegasus” done), Tamora Pierce,Jim Butcher, Jane Haddam and host of others, including Steven Havill. 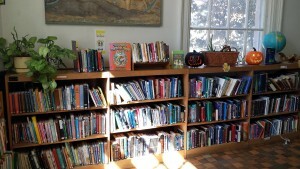 Patrons have told us that one of the reasons they moved to Raton to retire was the library. Just today a patron told me this was his social life and offered to volunteer by reading to others. 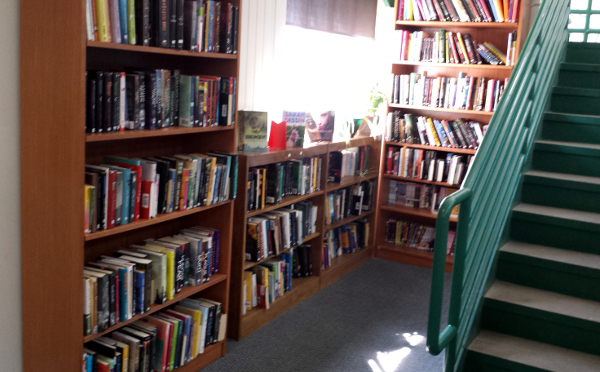 Visitors often tell us we have nice library for a town this size (which we know but always appreciate hearing). While many people (in fact, most of them) never have a supernatural experience in this library, they have been known to happen. They have including books flying off the tops of book shelves to land as far as eight to ten feet away. (I have observed this myself twice, both times during our late shift on Thursday nights.) Files moved out from a shelf they were stored on and fell to the floor in the storage closet one at a time, very slowly, under the fascinated and horrified gaze of two staff members in the office at the time. Once, during construction, two staff members were seated dangling their legs over the mezzanine on the second floor and saw the legs of a man going up the staircase. They were facing the top of the stair case and the man never showed up. PIus, this was during construction and they were the only two people in the building. This was also seen last year, when two staff members were shutting down and no one else was in the building. Monday mornings the library is closed, although at least one staff member is on duty to answer the phone and do background work . While alone, all three of the full time staff have heard low voices above their heads in the periodical room, the sound drifting through the mezzanine. When checked, no one is in the building. Staff members with long hair have reported feeling someone moving it when they are focused on a task during a time when we are not open to the public. One Monday morning recently, both staff members were in other parts of the building. Returning to the front, they found a perfectly straight line of children’s chairs between the picture books and shelves. It seems our ghosts prefer the quiet times. Either that or that’s when people notice. No one has any idea why this building would be haunted. It does sit on the site of a home built in the very early days of Raton. But to the best of our knowledge, no one has died in this building. No one has cursed this building. No one has ever been hurt in this building by ghostly activity. It’s a mystery.